LED lighting is all the rage – and for good reason in many applications. However, LED alone is not always the answer. High capital costs can outweigh the benefits, when in some areas, innovative lighting solutions using traditional technology, controls and sensors can vastly improve efficiency – and ROI. We recently worked with Redbourn Recreation Centre, combining Chalmor SportLux LED in their multi-use sports hall with refurbished Chalmor ReFit T5 equipment in lower-level areas. Controls and sensors were used throughout. The result was a 42% drop in energy bills! Redbourn Recreation Centre is a community sports centre, run by a Charitable Trust, serving the village and drawing from larger towns including St Albans and Harpenden. It opens daily from 9am to 10pm. The whole centre was lit between these hours, unless staff or visitors manually switched lights off. 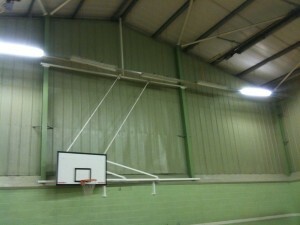 The sports hall reaches heights of 10 metres and was fitted with fluorescent strip lighting. As well as being inefficient and expensive to run, maintenance was costly due to accessing lights at high level. Consequently, lamps were not replaced often enough and light levels suffered. In addition, the 20 year old fittings had become fragile and continual knocks from balls were causing a safety concern. Due to the halls popularity with local teams, the Chalmor lighting design focused around the four badminton courts. Twenty-four Chalmor SportLux LED’s were installed. These high output fittings provide 12,000 lumens per LED, with spread of illumination in accordance with CIBSE Class III guidelines. SportLux LED provides flicker-free light, ensuring trajectory of fast moving objects will be clearly seen and in addition, features an integral grille to protect from impact from balls and shuttlecocks. The LED’s have a 70,000 hour maintenance figure, which equates to over 17 years of use at 11 hours opening per day. Chalmor BlueWave occupancy sensors were fitted to automatically switch off the lights when the hall is not in use, as well as saving energy, this will further extend the LED useful life. To offset the high investment required for LED’s in the hall, the lower-level areas, including the reception, fitness suite, bar, meeting areas and changing rooms were fitted with Chalmor ReFit T5. Existing fittings were retained and T8 lamps replaced with more efficient T5. The T5 lamps will need replacing more often than LED’s, but at low-level, this maintenance will be far less costly. Circuit controls were fitted to enable staff and visitors to alter the light to suit purpose (e.g. lower lighting for relaxing yoga classes, or full lighting for high impact activities). Occupancy sensors were installed in the changing rooms, to save energy in an area which had previously been lit continuously. The installation was completed over a two week period and combined with a full redecoration, resulting in a fresh, vibrant feel. Electricity bills were previously £1,260 per month, with an additional £2,000-£3,000 outstanding at the end of each year. Within the first two months of the new lighting, Redbourn Recreation Centre have moved to lower monthly payments and wiped out their deficit. They can expect to save £7,350 per year, which will provide a 4 year return on investment. Paul Sands, Redbourn Recreation Centre Manager noted “Not only are we saving money, but users have commented on the improvements in light quality. Chalmor were efficient and professional. They took care of the process from beginning to end including survey, design, installation, project management and commissioning. I didn’t need to specify or find contractors and the project went according to plan and to timescale”. If you know a sports centre in need of an upgrade, call us today on 01582 748700 or email. Please share using the buttons below and sign up to receive regular updates straight to your inbox here.